With the ElixirConf US last week, we’re celebrating all things Elixir. We have also launched our new Elixir Architecture Sessions - get in touch for more details. MongooseIM is one of the products we develop at ESL. It is a real-time messaging platform with a focus on performance and scalability. Therefore it is essential to perform load tests on such software. Here we look at building and developing an Elixir Stream including building a library and testing data. Not so long ago the load testing process was quite complicated and consumed too much developer time. 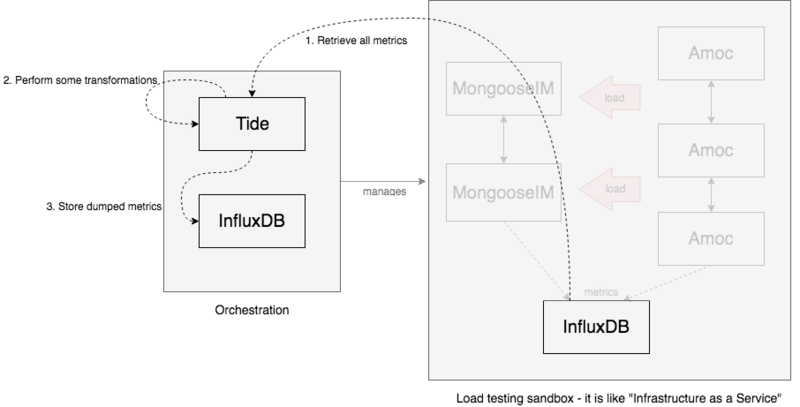 We took the effort to develop an automation tool, called Tide, to test MongooseIM both regularly and easily. It starts load tests with almost no effort from the developer in general. Tests are started in a sandbox environment. During such test, our load-generator Amoc and MongooseIM itself report metrics, describing the state of the test from a client and server perspective. Simulated clients exchange messages through the server, so the most important client metric is end-to-end message delivery time. We use InfluxDB for metrics storage. It is time series database, which efficiently stores metrics, and provides an API for performing analysis on data. store it in another instance of InfluxDB, let’s call it persistent. One technical problem, with this approach, is that InfluxDB yields data in a different format than it accepts as input. The output form of queries via the HTTP API has a JSON representation, however InfluxDB expects data in the Influx Line Protocol on writes. So in our product we also had to transform the format of data. and do a POST request to another instance of the database. query = "SELECT * FROM /. */"
This naive implementation has a few problems. First of all, it queries for all metrics in one request. This is okay when the expected amount of data is less than a few hundred data points. In our case, we were querying for tens of thousand of data points. Waiting for a response takes more than a minute and is likely to time-out. It worked pretty well! We got responses in reasonable time and the requests did not time-out. However, this solution still does not leverage the fact that data is being streamed from InfluxDB. We are blocked, until we receive all the data from the database. So the only advantage of this approach is that we are able to perform query such that the request is not timed-out at the database level. Dumping metrics still takes some time. Also, when we started using it, it turned out we are not able to dump metrics for a 1-hour long test. We observed that the system was running out of memory. Also it took quite a long time to dump it. Parameters for tests are at the bottom of the text. 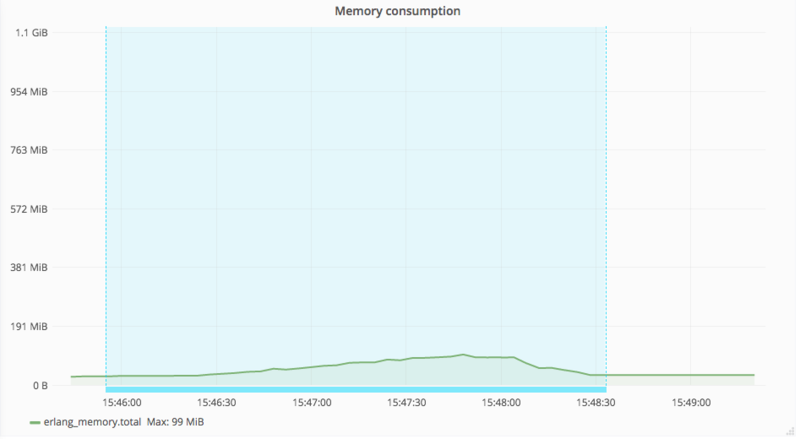 Memory consumption peaked as data was retrieved from the database. This happens, because it needs to store a whole, raw, JSON encoded string in memory before going further. 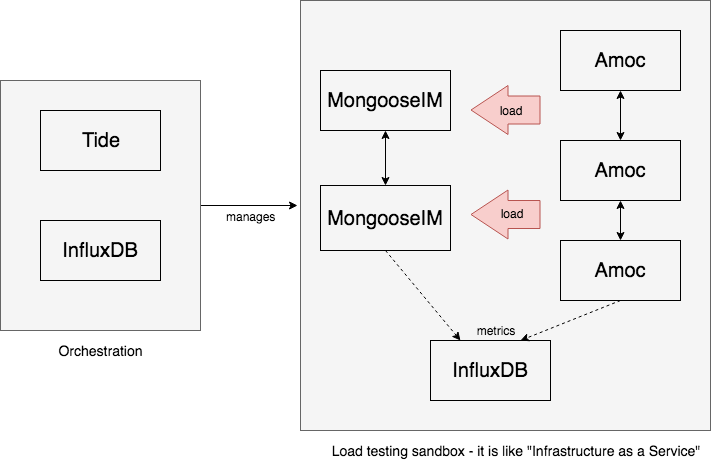 One of the solutions we come up with, was to wrap asynchronous InfluxDB responses into an Elixir Stream. We hoped it would speed up the dumping process as we wouldn’t have to wait for all the data before sending it. Another thing we hoped for, was the expected lower memory consumption as the data would be passed between the databases continuously. In other words, the system was expected to receive data from the inbound InfluxDB and push it to the persistent one at the same time and the processes would be more independent. Stream.resource/3 may be used to build a stream. It requires passing three function: Stream.resource(start_fun, next_fun, after_fun). The first function is called when Stream is initialized. As an example, the Elixir docs provide opening a file. In our case it would be initializing a connection to the database. Second function is called each time, when new element is requested. We would like to emit a batch of data points from InfluxDB when it is called. The last function is supposed to be called when the stream is finished and should perform some cleanup. We decided to use a GenServer as the “backend” for our resource. In fact, GenServer is not required here, however it was used to provide better separation, especially not to put any messages into the library user’s message queue. Avoiding GenServer should provide better performance, but we ultimately decided that this approach would be easier to understand, provide better isolation and still have good performance.. In this case latency introduced by message passing is really low comparing to the HTTP request latency. Messages sent by library are big binaries containing JSON string from InfluxDB, efficiently optimized by the Erlang VM. In short words, we accumulate chunks as they arrive. When the consumer asks for one of it, we simply return it. The consumer call is blocking, so if one is waiting for more chunks, the GenServer will eventually reply with either chunk or end the Stream. 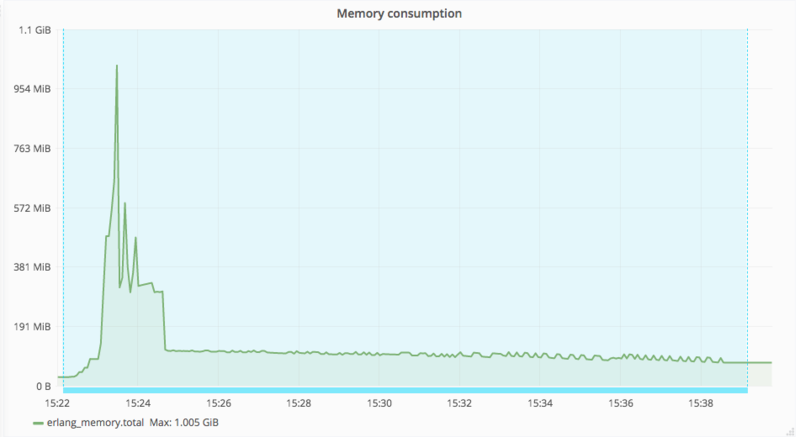 Below there is a graph with memory usage while dumping metrics with streams. It has the same scale as the previous graph. Parameters for tests are at the bottom of the text. As we can see performance is noticeable better. 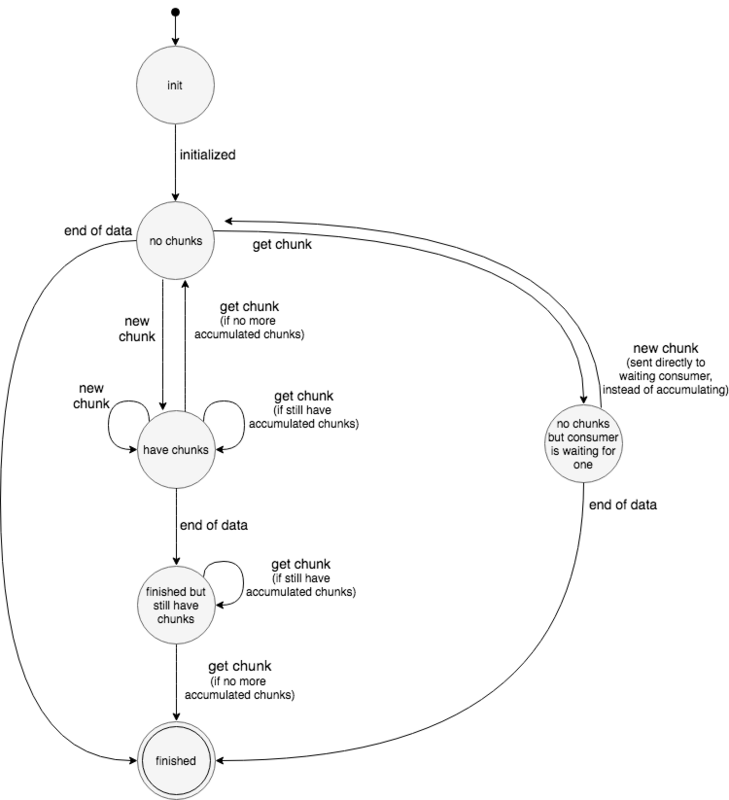 CaseTemplate for conveniently testing your application interaction with InfluxDB. It is available at GitHub. Above we presented all steps we did while constructing our solution. Starting with a naive solution usually does not solve problems, but it gives us a general view on what a good solution might look like! As you can see, our dump_metrics/0 function did not change much over time. Then, it is essential to find out, if a resource may be batched or chunked. It may be trivial in some cases, like reading a file from disk. In this case database allowed us to get chunked responses, however it required some effort to research it. Finally we need to design the data flow for our Stream resource. It need to be aligned with the Stream API. We used a GenServer as the backend for our Stream. So we are relying on message passing: while the Stream is running - we received both requests and new chunks as a message. It allowed us to build a reactive and event-based solution. Here are some facts about environments that was used for measuring performance. Destination and source InfluxDB instance was the same. Only different databases were used. Therefore performance for Stream solution is expected to be even better when destination and source are different. If you want to find out more about building an Elixir stream, or have any queries regarding this blog post or our Elixir Development, you can contact us at general@erlang-solutions.com. We also have a whole alchemy themed selection of blog posts to enjoy including more information about Elixir module attributes, Elixir mix configuration and fault tolerance.